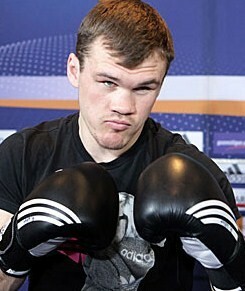 German lightheavyweight Robert Woge (12-1) have announced his retirement. Woge tells Mitteldeutsche Zeitung that health and family goes before anything else. Woge was last seen in October 2013 losing the IBF I/C title to Anatolij Dudchenko and finished - as usual - badly busted up. Robert Woge (pictured) was a fighter's fighter, a man who relied on his punch, workrate and willingness to take a punch to give one and almost every fight - amateur or pro - was very exciting to watch but didn’t make for a long career and wars with the likes of Hakim Zoulikha, Dariusz Sek and Dudchenko took their toll. Fact is that every fight I saw Woge in was a pure pleasure watch but was also overly exciting and Robert makes a wise decision in calling it a day. Robert was managed by Moritz Klatten and promoted by Sauerland Event. It's been rumored for a few days not but now Sauerland Event have confirmed that matchmaker Hagen Doering is longer with the team. There are no other details known. Doering took over from Jean Marcel Nartz and have been with Sauerland since around 2003.
Who will take over as matchmaker is not known.